When you first open the Campaign you are presented with the Detail tab. It is divided into two sections, Standard Details and Advanced Details. 1. This is the Status of the campaign showing if the campaign is in set up or has been initiated. 2. This is the Name of the Campaign, it is visible in the main campaign screen and is searchable from there. 3. This is the Notes of the Campaign, it is visible in the main campaign screen but is not searchable. 4. The launch date and time is the time at which the campaign will start sending once initiated, if this is in the past the campaign will start sending as soon as it is initiated. 5. The close date and time is the time at which no further emails will be sent from the campaign. This needs to be far enough in the future to allow all emails to send out, including follow up emails. Email is the one you will use most often. Follow up/Workflow removes the audience tab from the campaign as the campaign will get it's audience from the follow up criteria set on another campaign or the Workflow stage. RSS To Email allows you to integrate your GatorMail campaign with RSS feeds from your website. 7. There are five action types to choose from, Static, Static Recurring, Refresh Non-recurirng, Refresh Recurring and Campaign Series. Static - The campaign is initiated once only for the audience available at the time the campaign is run. New audience members, added after the campaign was initiated, who meet the selection criteria or are included in the group will not receive this campaign. Refresh Recurring - The Campaign will continue to be run with an interval set in weeks / months (Recurring) and new audience members, added after the campaign is initiated; who meet the selection criteria or are included in the group, will receive the campaign as it recurs (Refresh). Refresh Non-Recurring - The Campaign is initiated once only for each audience member. New audience members, added after the campaign is initiated, who meet the selection criteria or are included in the group, will receive the campaign (refresh) once only. Static Recurring - The Campaign will continue to be run with an interval set in days (Recurring) and new audience members, added after the campaign is initiated, who meet the selection criteria or are added to the group will not receive the campaign as it recurs. Campaign Series - The campaign is going to be part of a Campaign Series and therefore will not have an audience attached to it. Any recurring emails will not be sent to a recipient if they have already received an email in the last X weeks or X months. 8. The Sender Alias displays in a recipients inbox, this should be a friendly recognisable name for yourself, often a Company Name is used here. 9. The Sender Email address from is displayed in the recipients inbox. 10. The reply to address is the email address that is populated into the recipients TO: field when they hit reply, this is where the replies to the email will be sent. 11. Click here to expand to see the Advanced Details. This is the Unsubscribe set up that is used when a recipient clicks to unsubscribe. This is the Send to a Friend that a recipient see when they click to send to a friend. This simply allows you to select a campaign strategy of the campaign for reporting purposes. The selection at this time will have no effect and is not visible anywhere else in the product. The campaign code can be passed into links using Query Strings. You can set a campaign to go out in batches, so that the sending is staggered, it works on a 24/7 basis. This allows you to set time and day settings. If you also use Leads you need to ensure this is ticked so that your reporting in Leads is complete. If you wish to have a finished message on links once a close date is reached check this box and then enter a message to be displayed. Stop access now is the 'Emergency Stop' button. Use if an error in a survey or a landing zone is discovered after campaign is initiated. Use the text box to display a, 'Sorry page in maintenance' message. The icon next to this text box allows the message to be formatted in HTML with images etc. Unticking this check box means the campaign is now live once more. 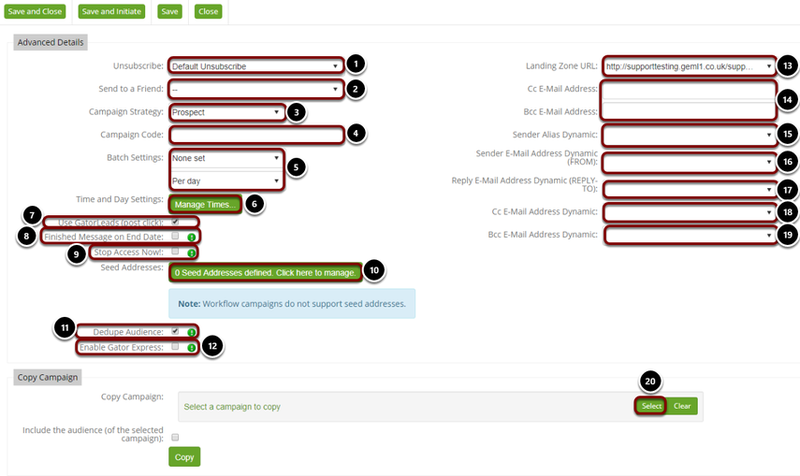 This allows you to manage the seed addresses that will receive this campaign. This allows you to enable the campaign to be a GatorExpress campaign. The Landing Zone URL is where your account is hosted, any Landing Zones, Surveys, Webcaptures and anything else hosted on CommuniGator will have this URL. The CC and BCC are not visible by default but can be switched on if necessary, please note that if you have an audience of 10k the CC or BCC address will receive 10k emails. Sender Alias Dynamic can be used to select a Contact field to be displayed when the email is delivered. An example of use would be to populate the Account Managers name here. Sender Alias Address can be used to select a Contact field to be displayed when the email is delivered. An example of use would be to populate the Account Managers Email Address here (however CommuniGator must be configured to send from the Domain used) There is a separate Article for more information on this. Reply Email address Dynamic can be used to select a Contact field to be displayed when the the recipient clicks reply. An example of use would be to populate the Account Managers Email here. The CC and BCC Dynamic is not visible by default but can be switched on if necessary, please note that if you have an audience of 10k the CC or BCC address will receive 10k emails. (optional) If you have approval groups set up you can select the approval group you would like to approve the campaign before sending. This will display as blank if you have not got approval set up. This item is normally used by integrated customers who's campaigns are created automatically thus removing the ability to copy the campaign on set up. Select the campaign you wish to copy from the drop down and tick whether to include the audience in the copy or not and then click copy.